Starting in 2016, a portion of the Miami International Boat Show will relocate to the grounds of the current Miami Marine Stadium set on Key Biscayne, an island off of mainland Miami, Florida. The Miami boat show, which currently spreads out over numerous in-water and on-land locations, has been forced to give up its indoor venue while renovations are completed on the Miami Beach Convention Center, at least through 2017. But Miami boat show manager, Cathy Rick-Joule, told the Miami Herald that the move to the new Miami Marine Stadium could be a longer-term one. 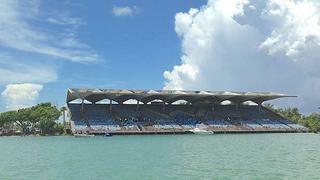 The fate of the Miami Marine Stadium, once a popular concert venue, has been unknown for sometime. The Friends of Miami Marine Stadium organisation had worked to raise private money, upwards of $120 million, to redevelop the area, but Miami city commissioners recently turned down its proposal. In it, the organisation would’ve served as the intermediary between the the National Marine Manufacturers Association (NMMA), the show’s owners and organisers, and the city. Instead, city of Miami commissioners have authorised the city itself to spend up to $16 million to upgrade the 60,703sqm area outside the stadium in order to host the Miami show. The grounds will be paved, covered with artificial turf and receive utilities. The NMMA will pay a rent of $1.1 million per year in rent, plus half of concessions and parking sales earned. While the commissioners voted unanimously, one commented on the riskiness of financing a $16 million facility with no long-term tenant, and the mayor of the village of Key Biscayne has called the process “rushed”. Rick-Joule, however, is confident relocating the event will benefit the city far past its duration and bringing in annual rent, citing the 100,000 boating enthusiasts that the boat show draws to the Miami area each year. “The marine industry here is so huge, this will be an unparalleled event,” she says. The next Miami boat show runs Feb 11-15, 2016.